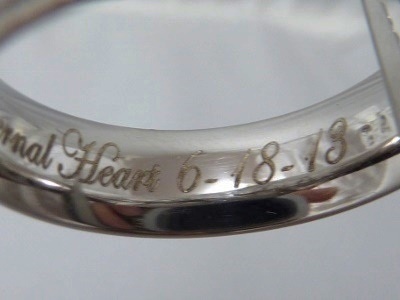 Why Should You Engrave an Inscription in Your Wedding Rings? 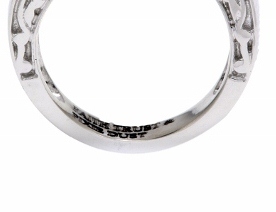 Before answering: what to engrave on a ring, it might be a good idea to first answer the question: why? It’s not required, right? The chaplain’s not going to inspect the rings before they’re exchanged, right? I’ve never seen a pastor call a stop to the ceremony and make you engrave your wedding rings first. Many people haven’t thought to have their rings engraved, so why should you? Adding a personal inscription to your wedding jewelry adds meaning to the most important piece of jewelry you’ll ever have. It makes it yours. 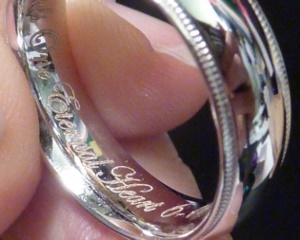 It is a romantic gesture to engrave an inscription inside your love’s ring. And if you add dates you’ll never forget your anniversary! 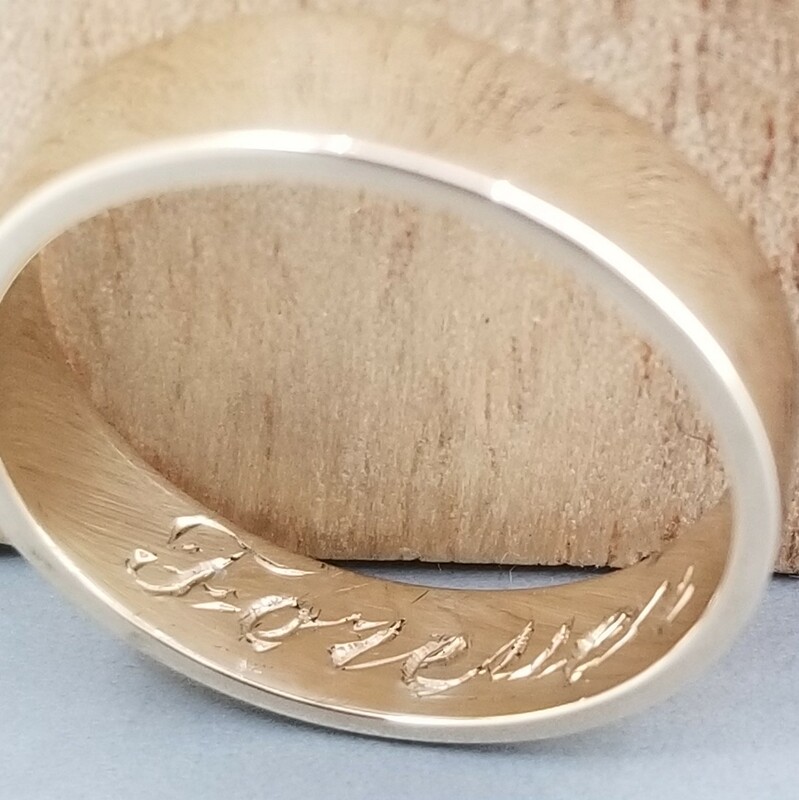 Now that I’ve convinced you your marriage is doomed to failure unless you engrave your wedding rings, what should you engrave? 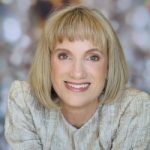 You and your betrothed names? The date you were married? A Biblical passage? Something prayerful? Something romantic? A message of undying love? Personal nicknames? The first five amendments of the Constitution? 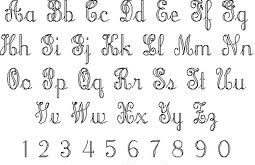 Engravings are similar to tattoos: they’re both meant to be eternal. They’re not completely, one hundred percent permanent and irreversible but…almost. You also need to consider that with engraving, unlike Twitter, you don’t have 144 characters with which to play. If you want to be able to read things without renting an electron microscope, you’re going to have to limit the message. Different engraving methods offer options of style, size and look. Read the engraving methods blog post. Obviously, the smaller the ring, the smaller the message. Without making the font so tiny as to be unreadable without that aforementioned microscope, you’re going to have to limit what you say. Typically, a date and initials will fit, or very short declarations of love. It’s a lot easier to read a block style font than a script style. Script is a pretty type of font, but it takes up more room on your ring. So if you’re just engraving the date and your initials there’s a good chance you can have it done in a pretty script style. But if you’re engraving “Edward heart Bella forever” or something with more characters, you’ll probably need to go with the block style. 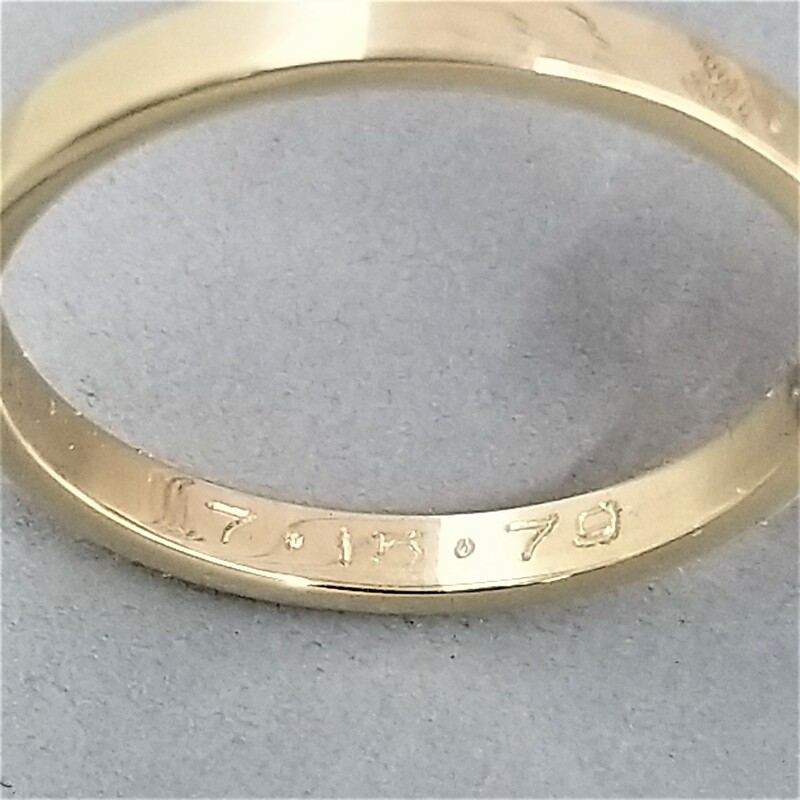 I’ve included the widths of the engraved rings in this blog to give you an idea of how engraving will look with different sized rings. Thus…think what you want to say. Talk to your spouse-to-be. They might want in on the action and want a matching inscription. Write down a list of possibilities and then narrow down the list. Show the short list to your Jeweler so they can let you know what will and won’t fit inside your ring. If you choose a 1.5mm width of ring not only will it be a candidate for future bending, but it’ll be hecka tough to engrave an inscription. 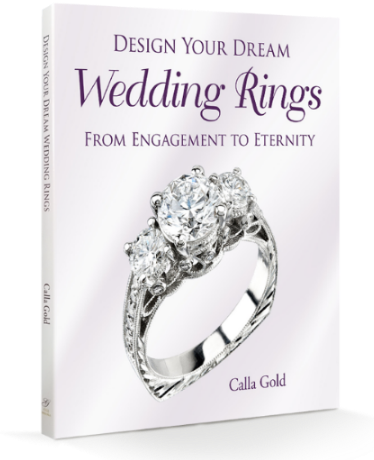 Finally, don’t despair if you haven’t engraved your ring prior to the wedding. 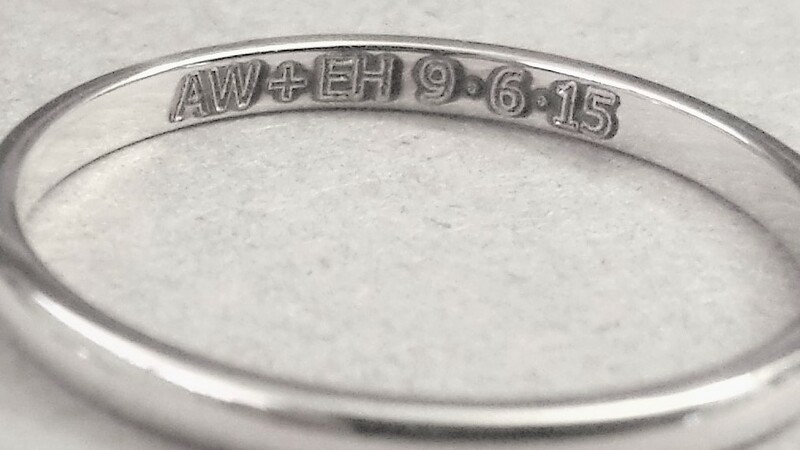 It’s OK. It’s never too late to engrave your wedding rings. In fact it’s quite romantic. Give me a call! I’ll be happy to engrave your ring for you. I thought everyone got their rings engraved. Phil and I just had the date engraved-so that when I’m 95 I can figure out how long we’ve been married. Oh-I forgot-we did have our initials also-next to the date. Engraving is nice for more than just wedding rings. I was given a beautiful watch with personalized engraving by my folks when I got my doctorate. It was a huge milestone for me and I have cherished that watch knowing that it is associated with that day. When I have doubts it is a nice reminder of what I have been able to achieve. 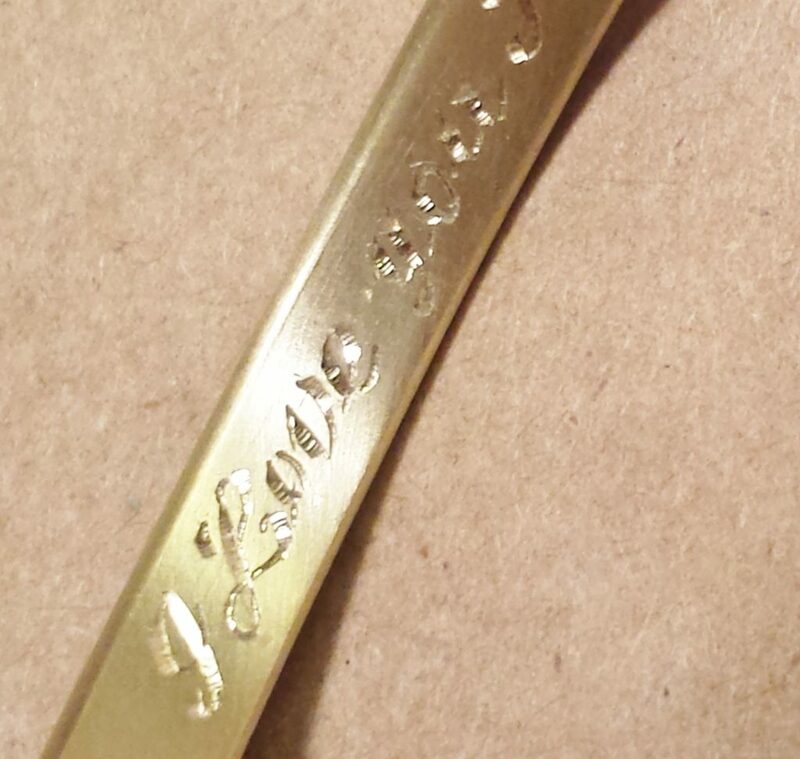 Thanks for the reminder of how personal engraving can further the meaning and importance of your jewelry. Always good advice from my Personal Jeweler! Thank you so much for your blog. Keep posting. 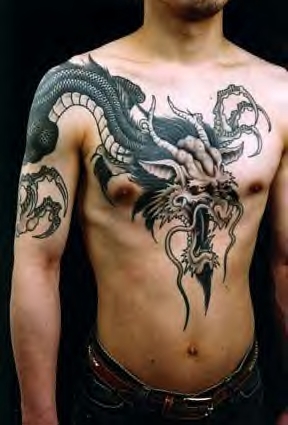 Engraving info is important, but the guy with the dragon tattoo is really important! I just celebrated my two year anniversary and never thought about engraving our wedding rings. Thanks for this inspiring reminder that it’s never too late to engrave them. Gonna talk to hubby about doing just that. Thanks! Comparing Wedding Rings to Tattoos is a bad idea. At least for me, it turned me off to your services immediately. They may be both eternal but, unlike a tattoo, you can take a ring of anytime. A tattoo is there forever and tattoos are both dull and ugly. The same cannot be said for most wedding rings. Calla, this is great information all in one place. What is your favorite, if you have one of styles for the decorative style. I mean for a vintage looking design? Do you like wheat or something more flowing?